Jesus told the woman: "It is not right to take the children's bread and give it to the dogs. First let the children eat all they want." The woman answered, "That is true, Lord. But the dogs under the table can eat the pieces of food that the children don't eat." Wow! Think how this would come off in our racially charged world of political correctness. Now double that and you get the impact of this exchange. Even though Jesus' statement about dogs (or puppies) might seem insensitive, he was undoubtedly testing this woman's faith. However, this woman will not let anything keep her from her goal. She wants Jesus to cure her daughter. Nothing will deter her. 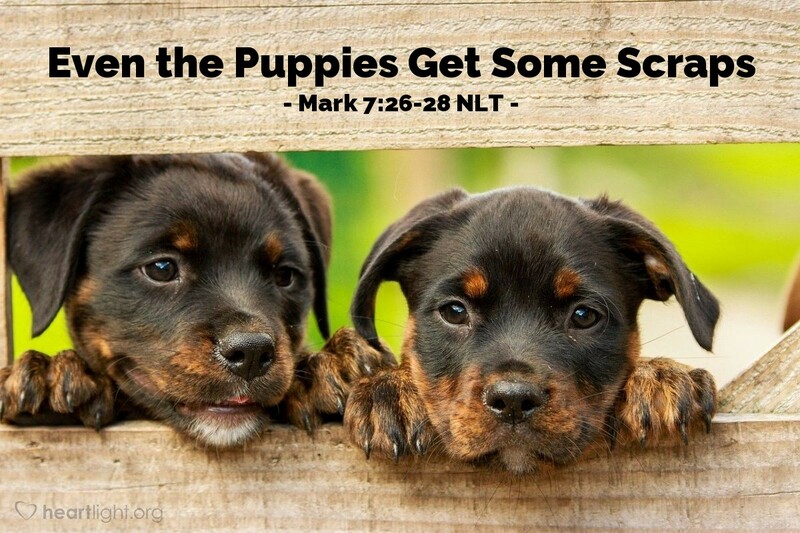 Jesus' earthly ministry may have been directed only to the children of Israel, but even in Israel the puppies get the scraps. What humility and commitment to not lose sight of her goal! I'm afraid my pride might have gotten in the way. I'm afraid my anger would have bubbled to the surface. But not this lady! Her passion did not go unnoticed. LORD God Almighty, I'm not sure I would have handled this situation as well as the woman in the story. Thank you for her faith and for her tenacity. Please give me more of both and help me be less reactive to language that is insensitively directed toward me. In Jesus' name. Amen.